← WHOA! Star Wars Night Light just $11.99! One of the best things that I have been able to do the last few years, was to earn free gift cards that I then use to Christmas shop. This practically eliminates the potential debt that some people enter at the end of the year. All my gifts are technically free! HOW DO I DO THAT, you ask? I do the VAST majority of my shopping on Amazon because of the amazing deals that I find. BUT! Above and beyond the great prices and free shipping….it’s even better than that when you have credits in your Amazon account and those smoking deals become SMOLDERING Freebies! This Christmas season, I cashed out $600 in free gift cards using this program alone! The great thing is, that because it’s free gift cards, you can apply the savings to ANYTHING! Even vacation! 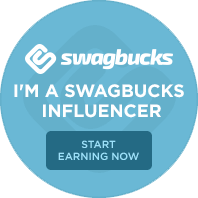 I know that many of my readers are on the Swagbucks bandwagon as I have pushed them to be SWAGGERS for over 8 years now. But some new folks may not quite understand it. So, if you are new and don’t have a clue what a Swagbuck is, YOU NEED TO! I talk about Swagbucks ALL the time….I have since I started using them in 2009. See, all you have to do is use them as your search engine and you will win SBs or SwagBucks from time to time. (Not every search, mind you!) You then cash these points out for gift cards from hundreds of top retailers like Amazon, Home Depot, CVS, JCP, many restaurants and much more! I save mine up and use them to pay for Christmas! Although, from time to time I will cash out a hundred or two dollars in PayPal cash when I am in a pinch! It’s great to know that this “Lagniappe Money” is there when I need it. There are many ways to earn your bucks, but I mostly do the searches, codes and REFER-A-Friend, obviously! Bigger gift cards are less points per dollar, but you can start off small, too! But, don’t be upset and think that you will never get to that point. You will!! But, if you -for whatever reason – prefer the smaller, quicker payouts, there is good news for you too! They offer a new $3 Amazon Gift Card which is only 300 SB. The $3 Amazon Gift Card allows you to redeem faster and get that quicker gratification! Most other retailers have $5 Gift Cards at 500 SB. If you are not using this program, you should be! This is how I have paid for Christmas for the last several years. I save up my Swagbucks all year and cash them out around October or November for Christmas Shopping! If you haven’t tried Swagbucks before, you can get a bonus $3 for signing up during December Swagbucks is a rewards site where you earn points (called SB) for things you’re probably doing online already, like searching, watching videos, discovering deals, and taking surveys. Then you take those points and exchange them for gift cards to places like Amazon, Starbucks, Walmart, Target, or PayPal cash. That’s it. It’s super easy, and Swagbucks is for real. I have used it myself for over 8 years now, and I’ve earned over $5000 in FREE GIFT CARDS! That helps take the sting out ! Swagbucks has issued a challenge to me this month and I would love to sign up 40 new friends/referrals! So, if you would like to earn free gift cards, this is a great, free and TOTALLY legitimate way to do it, CLICK HERE! Trust me! You can see above what I cashed out just in the last month or so! As always, PLEASE ASK IF YOU HAVE QUESTIONS! This entry was posted in Free Stuff, Individual Deals/Coupons, Swagbucks and tagged Free Gift Cards, Swagbucks, Vacation. Bookmark the permalink.